Row upon row of grapes growing on vines, almost ready for the picking and made into award winning red wine, at Bonitas Winery in the scenic Okanagan Valley. Blessed with a beautiful scenic landscape and hot summer sun, Bonitas Winery grow a variety of red and white grapes on their property to create their award winning wines. Clusters of red grapes growing on grapevines at Bonitas Winery, Summerland, Okanagan-Similkameen Region, Okanagan, British Columbia, Canada. 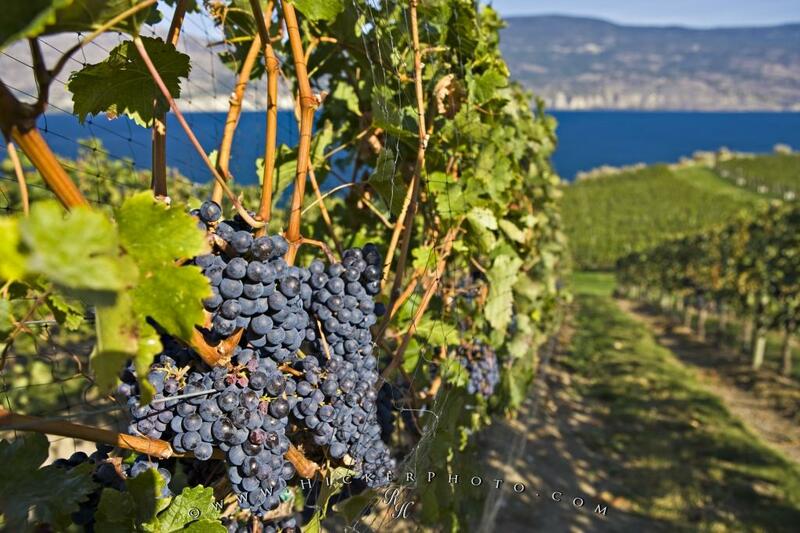 Photo of red wine grapes on the scenic shores of Okanagan Lake at Bonitas Winery in Summerland.